One of the biggest man-made landmarks in Cornwall is being removed. Antenna Two at Goonhilly Satellite Earth Station is being dismantled. BT says the dish has reached the end of its operational life. It is going to take engineers three months to dismantle the 960-tonne dish, which has dominated the skyline on the Lizard since it was built in 1968. For years, it has carried transatlantic television pictures, along with millions of telephone calls. Pictures of the Live Aid concert and the 1984 Olympics came through the dish. BT said that 38 years of windy and rainy weather in the area had taken their toll on the structure, meaning that maintaining the dish was no longer commercially viable. It added the dish had not been fully operational for more than 12 months. Newer satellite dishes on the site are now carrying transatlantic traffic. BT said it had no plans to remove any more of the dishes. 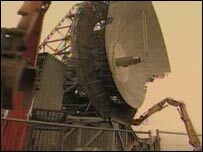 Goonhilly Earth Station Manager Alan Bradley said the dish had been involved in many important broadcasts. He said: "In 40 years, it's been involved all sorts of landmark occasions. "Any time we used to be glued to the television with the caption 'live by satellite', most of those pictures came through here." Much of the steel from the dish would be recycled, Mr Bradley said. But he added that a 10-tonne, 10m (33ft), elevation screw that helped position the dish would be made a permanent exhibit in the site's visitor centre.